Sonia Kovalevsky was a mathematician at a time when women were generally not allowed to hold professor positions. 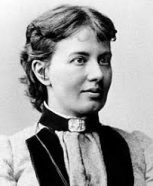 She became a great researcher as well as one of the first modern European women professors. Her significant work in mathematics and advocacy for women’s rights helped open doors for women in the university system. In honor of Sonia Kovalevsky, Iowa State University is organizing a Sonia Kovalevsky Mathematics Day! Young women in grades 6-12, along with their teachers and parents or guardians, are invited to a day-long program featuring workshops, interactive talks, small group discussions with female mathematicians, and fun math games. The goal of SK Day is to stimulate young women’s interest in mathematics, and encourage them to pursue a career in math and science. Keynote Session “The One-Cut Problem” – Discover the mathematics hidden in paper folding and cutting! Due to popular demand, we have had to close registration for this year’s event. If you have questions, please email mathevents@iastate.edu. We look forward to seeing you on March 30th from 9am – 2pm!